Here's an image of the socks mentioned in the previous post. As usual, the green doesn't look right, but the other colors do, so...imagine a rich, intense emerald green with that royal blue. Both blue and green socks are on the gusset decreases but not far along. One shows the heel reinforcement pattern they both have. The feet of these will be striped in emerald green and royal blue because--not enough royal blue to finish. (It's not a bug; it's a feature.) 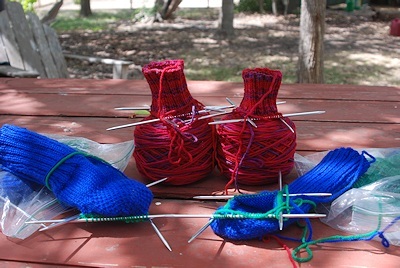 I hope to finish the gusset decreases today and get on to the race for the toes. As soon as the blue/green pair come off the needles, I'll cast on a pair of Herdwick wool socks for the coming winter (Yeah, I have only enough #5 needles for two pairs of socks at once...) The Herdwick yarn's a little harder to work with, so when the red/purple come off the needles, a more ordinary yarn will take their place. I think I'll alternate Herdwick and ordinary yarn (defined as other than Herdwick, for now) through the winter, and then switch back to shorty socks with the leftovers of the winter's knitting for another week's rotation of summer bike socks. They look good. You inspired me this summer to make several pairs of shorty socks from the left-overs of full-sized winter socks - I'm not as clever (or perhaps brave) as you are with the stripes and all, but I did do the heels and toes in a different yarn. And that said ... What is the pattern you're using for the heel reinforcement? I think it's called "eye of partridge". It's a slip-stich pattern offset by one each right-side row. All wrong-side rows are purled, until the sock is rejoined (and you're in the round), in which case the formerly wrong side rows are knitted. Row 1, slip one, knit one, repeat to end of row ending with knit stitch. Row 5, slip one, knit one, repeat to end of row. I hope you're enjoying the short socks. I also like that I can make them in about half the time of the regular ones. Use up leftovers, more socks in fewer weeks...a lot to like. Thank you for asking that! They will be if I don't keep making stupid mistakes. I was working on the gusset decreases one of the blue/green ones, counting carefully every single round, I swear, and suddenly the "downhill" side, as I think of it, disappeared two stitches and no longer matched when it should. I picked back and picked back and it's still...two stitches low. When I thought it was one stitch high. Either my brain is going or pixies are playing with the knitting every time I put it down. Or both. I gave it up for the night. Light will be better in the morning. The Mountain Colors knits up beautifully, but I do not want to make mistakes on that pair--they'll be the most expensive socks I own, for sure. Cheapest way is probably to get some sort of color card (anywhere from 10$ to as much as you want to spend, although 70$ is a bit of an industry standard), and then adjust at least your monitor so that what you see on the screen matches what you shoot and what you see with your own eyes. The fancier way is to get a calibration widget that can read the output from your screen and make sure it matches what "everyone else" is doing. Then you'll have to adjust what your camera takes ("white balance" is the start). Anyway. Just a long way of saying that ~12$ and a few minutes might solve your "this doesn't look like the real world") problems locally; something like ~150$ should fix the "what my editor sent me over email doesn't match what showed up on the ARCs a few months later" problem. Thanks. I suspect (don't know) that it's a white-balance problem, but this is the only green yarn it affects, and I'm just not that eager to try fiddling with that right now. However, I appreciate the information and if I can gather the energy and time to work this problem, I'll be following up, probably with the aid of the camera shop I use. Hah! "...the race for the toes." Visions of folks secured in stocks holding their feet out front, gravy or some-such poured over their toes, and a pack of puppies or cats released to race over and lick off the gravy. And I'm laughing. Thanks for that image. I have rather long feet. So one way to keep believing I'm making progress is to treat the two socks in a pair like a match race. I work on the shorter one, trying to catch up with the longer one...then switch and work on the now-shorter one. Otherwise, in the middle of the foot, where it seems to take forever to get to the toe decreases...I can lose interest. And some pairs of socks seem determined to have problems. This blue pair...has been slow, required a lot of undoing and redoing, and...grrr. It's the lighting. They're aluminum, silvery colored. By any chance are you on Ravelry, for knitters and crocheters?